Home » business » Luxury Brands – are they still attractive to millennials? Lesley Everett is the Founder of Walking TALL International, a Personal Branding Company, with offices in UK and US. She is an international speaker. As with any brand today, the customer experience when communicating with, and buying from that brand, needs to meet or exceed the expectation set by all the clever marketing and advertising methods we have today. That expectation bar, let’s face it, can be very high. The risk to not meeting that expectation lies in loss of brand authenticity and transparency, and a level of distrust in the brand. This risk is increased it seems when it comes to millennials and Gen-Z (born after 1995 generally). They are a generation that favour spending their hard earned money on experience rather than product alone. They demand a great buying experience, in-store and online, they value it and then talk about it to colleagues and friends and to the world on social media. If the expected experience is not present they are more affected by it than other generations and may lose interest in that brand and feel disillusioned. Millennials are more focused on experiences that reflect what they value – transparency and realness, a personality. The brand story behind the brand is important to them also, so they feel they know something about the culture of the company. If you’re not sharing your brand story in your marketing and via your people, you could quite possibly be losing millennial market share to your competitors. With luxury sunglasses brand Maui Jim, a customer often becomes a customer for life due to the consistent and exceptional level of customer service and experience that makes an individual feel like they are truly valued. They are not sold to again at every opportunity – instead they are connected with and engaged with the brand. Apple offer a similar experience with their Genius Bar and the personal service. Whereas some mid-level luxury car brands leave a lot to be desired in these areas and the only time they appear interested is when (and if) you are in the market for a new car. They fail to understand that millennial consumers will just go elsewhere next time if they have not been looked after by the brand and made to feel valued and important to them. Previous generations are more likely to stay brand loyal than change. Things are about to change with millennials set to represent more than 45% of the luxury market consumers by 2025. Some businesses and luxury brands, are not ready for this, yet they need to be. We also have to consider that the already accepted areas of business that might attract and win loyalty amongst millennials are no longer enough. Companies being seen to ‘do the right thing’ or that have strong Corporate Social Responsibility (CSR) policies no longer stand out for them – these things are accepted as the standard now. Doesn’t mean they are not important however, as their absence will have a negative impact too. So how can luxury brands ensure they are millennial-proofing their businesses, and providing what is important to the millennial buying decision right now? Get clear about your brand story. Incorporate it into social media posts, marketing campaigns and advertising. Ensure all your staff are aware of and understand the brand story and values – you need them all to be engaged with the ethos behind the business. Give your leadership the support they need to become strong well-known brands in their own right and increase their authentic visibility internally and eternally. This increases employee engagement and therefore ultimately employer brand and brand appeal. Consider all the customer experience touch-point opportunities you have in your business and assess how you can improve every single one to create an even more impactful overall experience that gets talked about. Even if you do just these few things, you will increase your appeal to millennials and Gen-Z. Today is about the customers’ experience. That experience is defined by the behaviors of your employees, and the behaviors are driven by your corporate culture, values and employee engagement. Therefore, to maximize your corporate brand investment, you need to focus on the authentic personality of your brand that is projected by your people. Walking TALL has been delivering personal and corporate brand personality programs since 2000, working in 26 countries, across 5 continents. 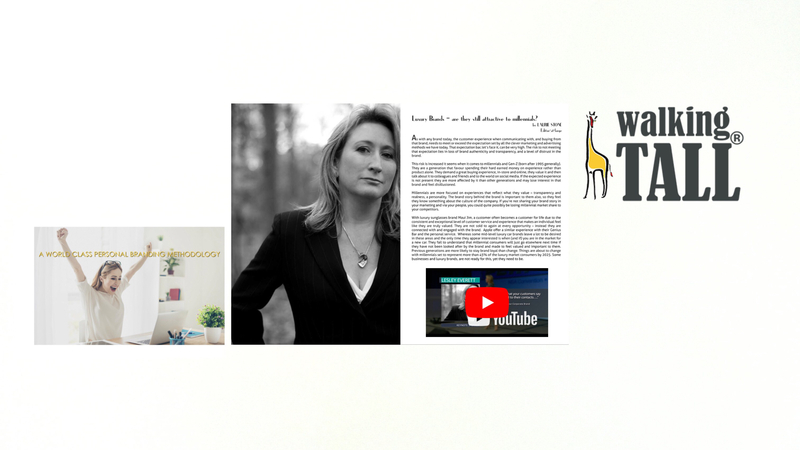 The company was founded by Lesley Everett who is an internationally recognized specialist in personal branding, an author, and a professional speaker. We offer a proven system to maximize corporate brand investment by giving individuals the tools to create a positive authentic impact with every stakeholder interaction. Our clients include JetBlue, Hilton, ASDA-Walmart, Unilever, Marriott Group, Microsoft and RSM and can all testify to the results. WHEN YOU WORK WITH US…..